Joining freelance groups and networks can make a huge difference in a freelance worker’s career. If you are considering joining and becoming a member of groups or networks, think about how you will find suitable groups and networks, what the advantages and disadvantages may be and how you can use freelance groups and networks efficiently. Freelance groups and networks can be either informal or formal. Informal groups and networks tend to spring up when freelancers find each other and decide to meet for a quick chat or a meal. These groups and networks are often focused on providing support and motivation. More formal groups and networks may be organised by professional associations, websites, freelancers interested in highly structured gatherings and more. These groups and networks can be advertised in local communities, in relevant trade magazines and journals, and on relevant websites. 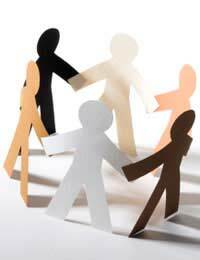 Joining freelance groups and networks brings many advantages. A member can expect to enjoy support from other freelancers, tap new sources of information and advice, learn about new markets and clients, and keep up on industry trends. Depending on the group or network, a member could also find legal or other professional assistance, emergency funding in the face of accident, injury or disaster, formal gatherings, workshops and seminars and even member discounts at particular shops or with particular service providers. Freelance groups and networks can also bring some disadvantages. Many require membership and a subscription fee which can be difficult for freelance workers to spend. All will take a freelancer away from his or her work, and if group meetings are far from the freelancer’s home then associated travel time and costs will come into play. Some freelance groups and networks may expect members to take up voluntary positions, which again can take a freelancer’s attention away from work, and getting involved can cause extra stress for a freelancer. However, most disadvantages of freelance groups and networks can be tempered if freelancers learn to use them efficiently. Using freelance groups and networks efficiently will likely take a period of trial and error to figure out how best to use these outlets. Many freelancers find that scheduling one group or network related activity each week or month helps them stay in the loop without devoting a great amount of time to them. Others may find that becoming involved in online activities such as forums or loops is a better way to use these organisations. Still others may find that receiving a newsletter or magazine is the most important part of the group or network. When you discover what works best with your schedule, don’t be afraid to stick to this plan. Joining freelance groups and networks can bring freelance workers both advantages and disadvantages. Finding the right groups and networks, and learning to use them efficiently, should help temper any potential disadvantages for freelancers.